Today marks the start of the 31 Day Challenge and it looks like quite a lot of bloggers and instagramers are going to participate. 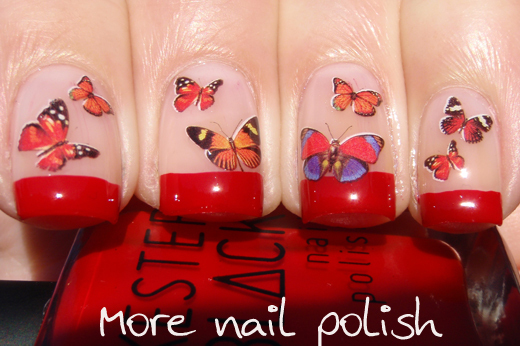 Well done to Sarah from Chalkboard Nails who has got us all motivated to participate collectively! It's my first time doing the challenge and I'm really looking forward to having themes to create nail art around. Having a theme somehow makes my brain work better rather than trying to think of something from scratch. I have two aims for the challenge: No 1 is to complete every day of the challenge and post it on my blog and instagram every day. 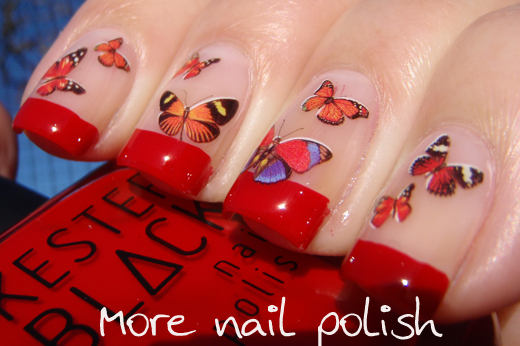 No 2. is to create a full mani every time on all 10 nails, not just to create nail art on four fingers for the photos. 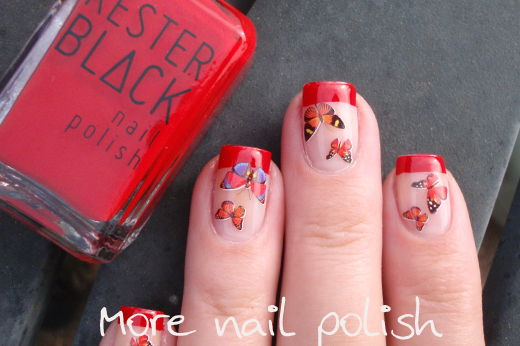 Lets get started with mani number 1, themed around red nails. I actually created this mani in blue about a week ago, but it's not as nice as this one. I will show that blue one later (maybe on blue day or may after the challenge is finished). 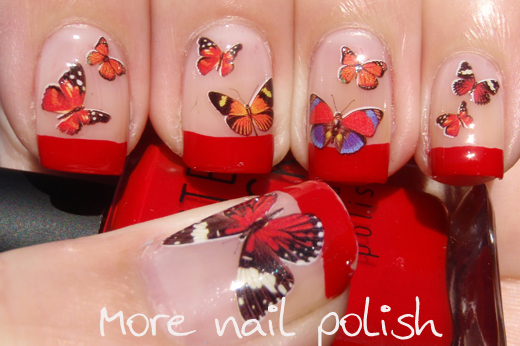 For this mani I used one coat of Bourjois Rose Lounge as the base colour. I painted the french tip using Kester Black polish in Cherry Pie- an amazing one coater red which I will review soon. 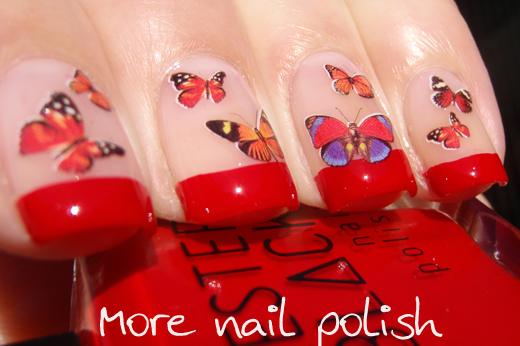 The red butterflies are water decals I got in a sheet of coloured butterflies from the Born Pretty Store. More details on the decals below. The water decals come from the Born Pretty Store and are item number #5310. The detail on each butterfly is fantastic and while they are themed in colour groups, they also include other colours on each butterfly to keep them natural and real looking. 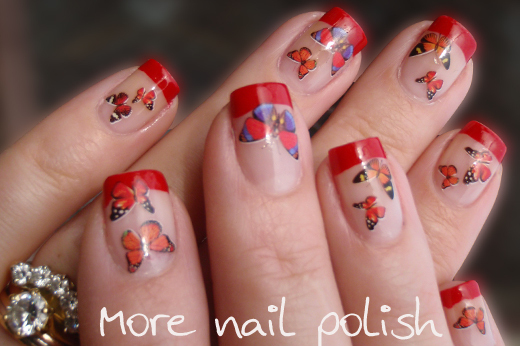 They come in a large sheet of butterfly decals with enough decals of different sizes to create a mani like this eight times. You can see the blue butterflies I used for my first blue version. Use my BP store code to get 10% off: MNPG10. I've created an inlinkz for every day of the 31 Day challenge. If you are participating, feel free to grab the codes here. Don't forget to add your link. It's really gorgeous! *-* Love it so much! Thanks for setting up the inLinkz links!! Thanks for the links! 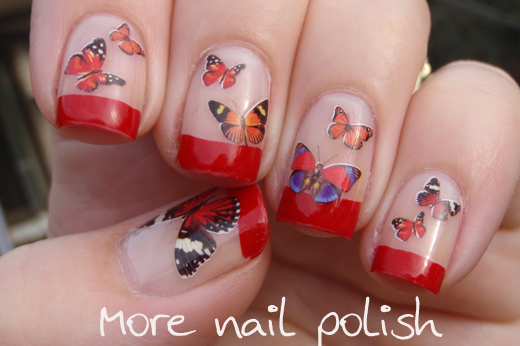 I am now a part of this challenge and it made me start my own nail art blog. I am exited to follow you all during these days.